Once some time ago I somehow made my brush sizes more adjustable.. But now they're like normal - one grid square each time you move it. How to you change it so it's like 1/5 of the grid square instead of ^ ? In Hammer: Map-> Adjust Grid-> Smaller/Bigger Grid. Or you can use the shortcut keys: [ or ]. Currently when I make the brush larger it takes one square - which makes it to big. How do you change it so you can take a bit of the square everytime - like 1/4 or 1/5 of it? You cannot. 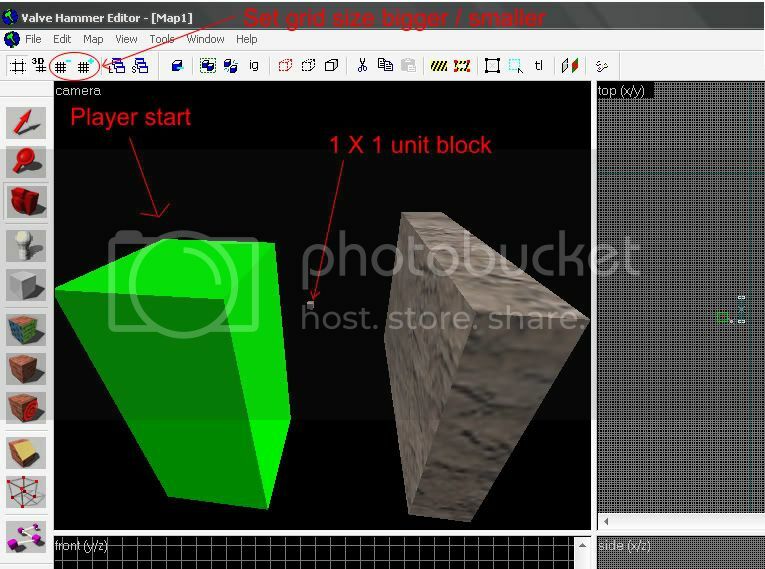 It works like this: The smallest size in Valve Hammer Editor is one unit (This "one unit" happens to be the smallest grid size too). Each time you increase the grid size, it doubles. So the possible grid sizes are: 1, 2, 4, 8, 16, 32, 64, 128... The standard grid size is 64 units. If you want a quarter of that, decrease the grid size twice- to 16. If you want a fifth of that, you can't- 64 doesn't divide by 5. But you can decrease the grid size 4 times (to 4 units) and the make a 3x3x3 cube. This is roughly a fifth of 64. It's not the grid I'm talking about.. When you drag it, it creates one square with the size of a grid square. I mean: I gotta create a wall with a hole you can shoot through. The problem is that this way I can't make the brush small enough. As eDan Co. already said, decrease the grid-size and you will be able to create smaller brushes.